Produces one or more plots with the vertical axis on the right side of the graph against which a second variable can be plotted. Requirement: You cannot use the PLOT2 statement alone. It can be used only with a PLOT or BUBBLE statement. At least one plot request is required. specifies the color of the outline that is drawn around filled areas. specifies a color for all text on the axes and legend, including axis labels, tick mark values, legend labels, and legend value descriptions. fills all the areas below plot line n with a pattern. generates a legend or specifies the legend to use for the plot. removes the last area of a plot when the value specified by the AREAS= option exceeds the number of bounded areas in the plot. suppresses the legend that is generated by a plot request of the type y-variable*x-variable=third-variable. places all the plots that are generated by the PLOT statement on one set of axes. displays the regression equation that is specified in the INTERPOL= option of the SYMBOL statement in the lower left corner of the plot. breaks a plot line or an area fill at occurrences of missing values of the Y variable. draws reference lines at all of the major tick marks on the vertical axis. specifies the type of reference lines drawn with the AUTOVREF, VREF, and GRID options. specifies that the order of the values on the vertical axis be reversed. plots the values of two variables and can assign a SYMBOL definition to the plot. variable plotted on the right vertical axis. number of the nth generated SYMBOL definition. plots the values of two or more variable and produces a separate graph for each combination of Y and X variables. variables plotted on the right vertical axes. variables plotted on the horizontal axes. 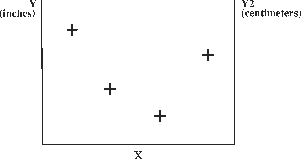 classification variable against which y-variable and x-variable are plotted. Third-variable can be character or numeric, but numeric variables should contain discrete rather than continuous values, or should be formatted to provide discrete values. For more information about plot requests, see PLOT Statement. In a PLOT2 plot request, the X variable for the horizontal axis must be the same as in the accompanying PLOT or BUBBLE statement. Typically, the Y variable for the right vertical axis is different. Use the same types of plot requests with a PLOT2 statement that you use with a PLOT statement, but a PLOT2 statement always plots the values of y-variable on the right vertical axis. AREAS=1 fills the first area. AREAS=2 fills both the first and second areas, and so on. If you specify a value for the AREAS= option that is greater than the number of bounded areas in the plot, the area between the top plot line and the axis frame is filled. See the SYMBOL Statement for details about interpolation methods. By default, the AREAS= option fills areas by rotating a solid fill through the list of colors defined in the current style. If the NOGSTYLE option is specified, the areas are filled by rotating a solid fill through the device's color list. If the graph needs more patterns, it rotates hatch patterns, beginning with the M2N0 pattern. See the PATTERN Statement for more information about map and plot patterns. However, if color is limited to a single color with the CPATTERN= or COLORS= graphic options, the solid pattern is skipped and the first default pattern is M2N0. If the COLORS= graphic option specifies a single color, use as many SYMBOL statements as you have areas to fill because the INTERPOL= setting does not automatically apply to multiple symbol definitions. You can alter the default pattern behavior by specifying patterns and colors on PATTERN statements that specify map and plot patterns. A separate PATTERN definition is needed for each specified area. If you specify the PATTERN statements, the AREAS= option uses the lowest numbered PATTERN statement first. If it runs out of patterns, it uses the default behavior for map and plot patterns. See the PATTERN Statement for details. Pattern definitions are assigned to the areas below the plot lines in the order the plots are drawn. The first area is that between the horizontal axis and the plot line that is drawn first. The second area is that above the first plot line and below the plot line that is drawn second, and so on. If the line that is drawn second lies below the line that is drawn first, the second area is hidden when the first is filled. The plots with the lower line values must be drawn first to prevent one area fill from overlaying another. If the lines cross, only the part of an area that is above the previous line is visible. Therefore, when creating multiple plots in combination with the OVERLAY option, the PLOT statements must be ordered so that the plot request that produces the lowest line value is first (leftmost), the plot request that produces the next lowest line value is second plot request, and so on. If you produce multiple plots with a y-variable*x-variable=third-variable plot request, the lines are plotted in order of increasing third variable values. In that case, you must recode your data so that the lowest value of the third variable produces the lowest plot line, the next lowest value produces the next lowest plot line, and so on. If you use the VALUE= option in the SYMBOL statement, some symbols might be hidden. If you also specify reference lines with the AREAS= option, they are drawn behind the pattern fill. Notes:The AREAS= option works only if all plot lines are generated by the same PLOT or PLOT2 statement. If you have specified the NOGSTYLE option and the first color in your device's default color list is black, color rotation begins with the second color in the list. That is, there are no solid black patterns. See How Default Patterns and Outlines Are Generated for more information. draws reference lines at all of the major tick marks on the vertical axis. If you also use the AREAS= option, the filled areas cover the reference lines. To draw lines on top of the filled areas, use the FRONTREF option in either the PROC GPLOT statement or the PLOT statement. LAUTOVREF=, CAUTOVREF=, and WAUTOVREF= options can be used to change the line types, colors, and widths of these reference lines. To specify labels for these reference lines, use the VAXIS= option. specifies the color of reference lines drawn at major tick marks on the vertical axis, as determined by the AUTOVREF option. If you do not specify the CAUTOVREF option, the default color is the value of the CAXIS= option. If neither option is specified, the default color is retrieved from the current style or from the device's color list if the NOGSTYLE option is specified. specifies the color for the axis line and all major and minor tick marks. The default color is retrieved from the current style or from the device's color list if the NOGSTYLE option is specified. fills the axis area with the specified color. If the FRAME option is also in effect, the procedure determines the color of the frame around the axis area according to the precedence list given within the FRAME option description. Restriction:CFRAME= is overridden by the NOFRAME and IFRAME= options. If the IFRAME= option is in effect, an image appears in the axis area instead of the color. If you do not specify a PATTERN statement, the default outline color is the color defined in the current style. If you specify the NOGSTYLE option and no PATTERN statement, the default outline color is black for the Java or ActiveX devices. Otherwise, the default outline color is the foreground color. If you specify an EMPTY PATTERN statement, then the default outline color is the same as the fill color. The COUTLINE= option overrides the SYMBOL statement option CO=. The AXIS statement's VALUE= color is used for axis values, and its LABEL= color is used for axis labels. However, if the AXIS statement specifies only general axis colors with its COLOR= option, the CTEXT= color overrides the general COLOR= specification and is used for axis labels and values. The COLOR= color is still used for all other axis colors, such as tick marks. Note:If you use a BY statement in the procedure, the color of the BY variable labels is controlled by the CBY= option in the GOPTIONS statement. specifies the color of reference lines drawn perpendicular to the vertical axis. This option affects reference lines drawn with the AUTOVREF, VREF, and GRID options. Specifying a single color without parentheses applies that color to all reference lines. The CAUTOVREF= option overrides the CVREF= option for lines drawn with the AUTOVREF option. Specifying a single color in parentheses applies that color only to the first reference line drawn with the VREF= option. Specifying a color list applies colors sequentially to successive reference lines drawn with the VREF= option. The syntax of the color list requires parentheses and colors separated by spaces (color1 color2... colorN). If you do not specify the CVREF= option, the GPLOT procedure uses the color specified by the CAXIS= option. If neither option is specified, the default color is retrieved from the current style of from the first color in the color list if the NOGSTYLE option is specified. specifies whether a line is drawn around the axis area. The default is FRAME. If you also use a BUBBLE2 or PLOT2 statement and these plotting statements have conflicting frame specifications, FRAME is used as opposed to NOFRAME. To fill the axis area with a color, use the CFRAME= option. To fill the axis area with an image, use the IFRAME= option. draws reference lines at all major tick marks on both axes. The line color is the color of the axis. When specified in a PLOT2 statement, the reference lines are drawn on the vertical axis on the right side of the plot. For Java and ActiveX, the PLOT statement is partially supported by the JAVA and ACTIVEX devices, and fully supported by the JAVAIMG and ACTXIMG devices, and the PLOT2 statement is supported only by the ACTXIMG device. For more information about the ORDER= option see ORDER=(value-list) | DESCENDING in the LEGEND statement. a plot request of the form y-variable*x-variable=third-variable automatically generates a default legend that identifies which colors and plot symbols represent each value of the classification variable. In these plot types, override the default by using LEGEND=LEGENDn to assign a defined LEGEND statement to the plot. If you use the SHAPE= option in a LEGEND statement, the value SYMBOL is valid. If you use the PLOT statement's AREAS= option, SHAPE=BAR is also valid. specifies the type of reference lines drawn with the AUTOVREF, VREF, and GRID options. The reference-line-type value can be a whole number from 1 to 46. A value of 1 specifies a solid line; values 2 through 46 specify dashed lines. This option affects reference lines drawn with the AUTOVREF, VREF, and GRID options. Specifying a single line type without parentheses applies that line type to all reference lines. The LAUTOVREF= option overrides the LVREF= option for lines drawn with the AUTOVREF option. Specifying a single line type in parentheses applies that line type only to the first line drawn with the VREF= option. Specifying a line-type list applies line types in sequence to successive reference lines drawn with the VREF= option. The syntax of the line type list requires parentheses and line types separated by spaces (type1 type2... typeN). The default line type is retrieved from the current style, or if the NOGSTYLE option is specified, the default value is 1, which draws a solid line. To specify colors for these references lines, use the CVREF= option. To specify labels for these reference lines, use the VAXIS= option. For needle plots that are generated with a Java or ActiveX device driver, the value of the LVREF= option is not applied to the default reference line that is drawn at zero when the minimum value of the vertical axis is less than zero. This line is solid (not dashed). removes the last area of a plot when the value specified by the AREAS= option exceeds the number of bounded areas in the plot. The last area is the area between the last plot line and the axis frame. You can use the NOLASTAREA option in PLOT and PLOT2 statements. However, when both PLOT and PLOT2 statements exist, the NOLASTAREA option is ignored in the PLOT statement. The NOLASTAREA option is also ignored in both PLOT and PLOT2 statements when the AREAS= option is not specified or when the number of bounded areas in the plot is less than or equal to the value specified by the AREAS= option. Note:Certain conditions related to the PLOT2 statement might result in variations in the behavior of the NOLASTAREA option. places all the plots that are generated by the PLOT statement on one set of axes. The axes are scaled to include the minimum and maximum values of all of the variables, and the variable names or labels associated with the first pair of variables label the axes. The OVERLAY option produces a legend if you include the LEGEND or the LEGEND=n option in the PLOT statement. OVERLAY is not enabled with plot requests of the form y-variable*x-variable=third-variable. However, you can achieve an overlay effect by using a PLOT and PLOT2 statement. if the PLOT or PLOT2 statement is combined with the global SYMBOL statement when the SYMBOL statement uses the INTERPOL= BOX, HILO, or STD. or for JAVA output using the PLOT2 statement, in a SYMBOL statement when the SYMBOL statement uses the INTERPOL= BOX, HILO, or STD, with or without the OVERLAY option. displays the regression equation that is specified in the INTERPOL= option of the SYMBOL statement in the lower left corner of the plot. You cannot modify the format that is used for the equation. The GPLOT regression equation is computed from the screen coordinates of the markers. Therefore, a graph might not be displayed if the chart area for the plot becomes so small that markers cannot be drawn because there are no coordinates from which to build the regression equation. In such cases, the regression equation is no longer meaningful. breaks a plot line or an area fill at occurrences of missing values of the Y variable. By default, plot lines and area fills are not broken at missing values. The SKIPMISS option is available only with JOIN interpolation. If the SKIPMISS option is used, observations should be sorted by the independent (horizontal axis) variable. If the plot request is y-variable*x-variable=third-variable, observations should also be sorted by the values of the third variable. specifies the major tick mark values for the vertical axis or assigns an axis definition. For a description of value-list see HAXIS=value-list | AXIS<1 . . . 99> for the PLOT statement. To assign labels to reference lines, use an axis definition that contains the REFLABEL= option. The labels are applied in sequence to all reference lines defined with the AUTOVREF and VREF= options. draws one or more reference lines perpendicular to the vertical axis at specified points. For a description of value-list see HAXIS=value-list | AXIS<1 . . . 99> for the PLOT statement. If the AREAS= option is also used, the filled areas cover the reference lines. To draw lines on top of the filled areas, use the FRONTREF option. LVREF=, CVREF=, and WVREF= options can be used to change the line types, colors, and widths of these reference lines. To specify labels for these reference lines, use the VAXIS= option. specifies line widths for reference lines as determined by the vertical axis. Line widths are specified as whole numbers. Specifying a line width without parentheses applies that type to all reference lines drawn with the AUTOVREF and VREF= options. Note that the WAUTOVREF= option overrides WVREF=reference-line-width for reference lines drawn with the AUTOREF option. Specifying a single line width in parentheses applies that line width to the first reference line drawn with the VREF= option. Specifying a line width list applies line widths in sequence to successive reference lines drawn with the VREF= option. The syntax of the line-width list requires parentheses and line widths separated by spaces (width1 width2 ...widthN). The default line width is specified by the current style or by the AXIS statement's WIDTH= option. (By default, WIDTH=1.) .To specify a color for these reference lines, use the option CVREF=reference-line-color | (reference-line-color) | (reference-line-color-list). See PLOT Statement for descriptions of options that you can use with the PLOT2 statement. You can use statement options to manipulate the axes and modify the appearance of your graph. You can use SYMBOL definitions to modify plot symbols for the data points, join data points, draw regression lines, plot confidence limits, or specify other types of interpolation. For more information about the SYMBOL statement see About SYMBOL Definitions. Note: When using the PLOT2 statement to generate output with the Java or ACTIVEX device drivers, and when the global statement SYMBOL is used, the value of the SYMBOL statement option INTERPOL= cannot be BOX, STD, or HILO. In addition, you can use global statements to modify the axes; to add titles, footnotes, and notes to the plot; or to modify the legend if one is generated by the plot. You can also use an Annotate data set to enhance the plot. These statements produce two graphs, each with two vertical axes. The first pair of plot requests (Y*X and Y2*X) produce one graph in which X is plotted on the horizontal axis, Y is plotted on the left axis, and Y2 is plotted on the right axis. The second pair of plot requests (B*A and B2*A) produce another graph in which A is plotted on the horizontal axis, B is plotted on the left axis, and B2 is plotted on the right axis. 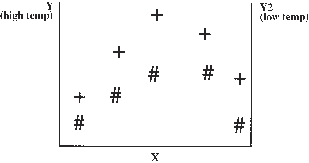 Plot requests of the form (y-variable(s))*(x-variable(s)). Both the PLOT and PLOT2 statements generate multiple graphs (the actual plots are produced on separate pages). See Graphs Produced by Multiple Plot Requests in PLOT and PLOT2 Statements. When both the PLOT and PLOT2 statements use plot requests of the form y-variable*x-variable=third-variable, each statement generates a separate legend. If the third variable has two values, these statements produce one graph with four sets of data points. See Multiple Plots on One Graph. 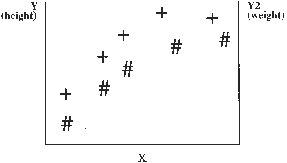 The figure assumes that SYMBOL statements are used to specify the plot symbols that are shown and to connect the data points with straight lines. If your data contain the same variable values in two different scales, such as height in inches and height in centimeters, you can display one scale of values on the left axis and the other scale of values on the right axis. 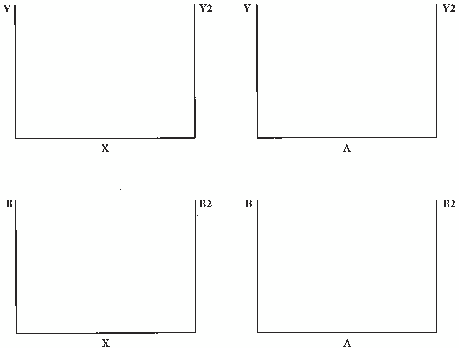 If both vertical axes are calibrated so that they represent the same range of values, then for each observation of X the data points for Y and Y2 are the same. For example, if Y is height in inches and Y2 is height in centimeters and if the Y axis values range from 0 to 84 inches and the Y2 axis values range from 0 to 213.36 centimeters, the plot is displayed like Right Axis with Different Scale of Values. For these types of plots, the PLOT2 statement should use a SYMBOL statement that specifies INTERPOL=NONE and VALUE=NONE. If your data contain variables with different data values (such as height and weight), you can display one type of data on the left axis and another type of data on the right axis. 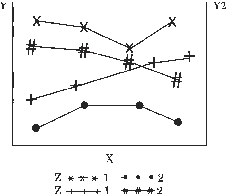 Because the Y variable and the Y2 variable contain different data, two sets of data points are displayed on the graph. For example, if Y is height and Y2 is weight, the plot is like Right Axis with Different Values and Different Scale. If your data contain two sets of values for the same type of data, you can use the PLOT2 statement to generate a right axis that is calibrated the same as the left axis so that the data points on the right of the graph are easier to read. For example, if Y is high temperatures and Y2 is low temperatures, you can create a graph like Right Axis with Same Scale of Values. To scale both axes the same, specify the same range of values either with the VAXIS= option in both the PLOT and PLOT2 statements, or with AXIS statements. The PLOT2 statement uses PATTERN and SYMBOL definitions in the same way the PLOT statement does. These definitions are assigned in order first to the PLOT statement and then to the PLOT2 statement. For more information, see About SYMBOL Definitions.